"Completely and securely clean your hard drives that you plan to give away or sell." If you are running a company that operates using a lot of computers - every so often when you upgrade your inventory of computers, you'll probably want to give away or sell the computers entirely or for parts. These computers contain hard disks with your private data on them that can be compromised by those that you sell the hardware to. So, it is important to completely and securely delete the data that you have on the hard drives before selling them or giving them away. 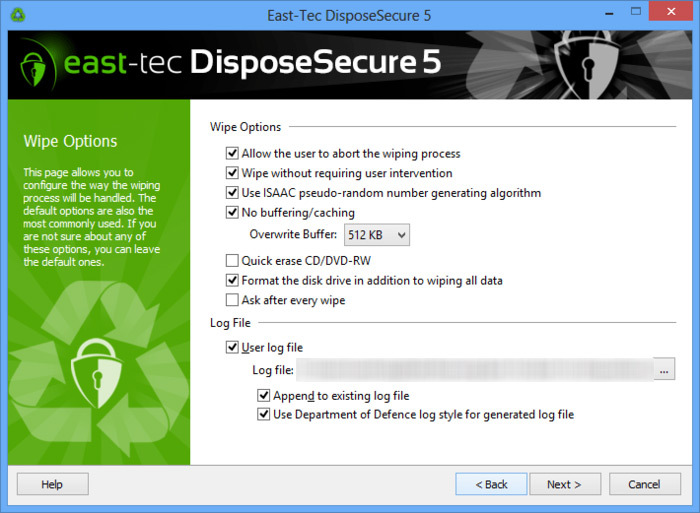 Using software like East-tec's DisposeSecure 5, you can make sure that the data that remains on the hard drives will not be accessible by the new owners of the drives after you give them away. The software's purpose is to make sure that the hard drives you have on-hand have their files completely deleted before giving the hard drives to another party. This ensures that if there was any sensitive data running on your systems that the new party will not be able to access your private information on purpose or by accident. This completely makes sense if you are a private company with private information and data upgrading your inventory. With DisposeSecure, you can install the software on a bootable disk - a CD or flash drive - and delete all of the data on your drives completely independent of the operating system that is install on those drives. This ensures that the operating system will not interfere with the deletion of the data, and will also allow you to completely delete the operating systems that are on the drives. If a bootable disk is just not an option, you can always just securely delete data on other hard drives by running the software on Windows. At the end of the deletion process, the software gives you a detailed wiping report so you can be sure that the data you wanted to delete is completely gone with no question. 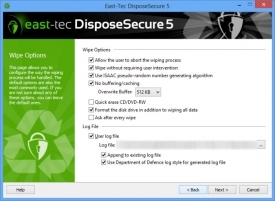 With all of the risks involved, this makes it important to use software like East-tec DisporeSecure 5 to make sure that all of your sensitive and private data doesn't end up in the wrong hands simply because you want to sell and recycle your old hardware.